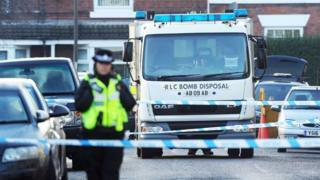 The cordon around one of the properties - the Fatima community centre on Brunswick Road in Burngreave - was extended on Tuesday afternoon and the bomb disposal unit attended. Four men were arrested - all at their home addresses. A neighbour in Shirebrook Road, Sheffield, reported hearing "an enormous bang" as one of the raids took place at 05:30. Carol Perry, who lives two doors from the scene, said: "I was asleep and then I was woken suddenly... and the house shook. "My immediate thought was that it was an earthquake." A spokeswoman from Counter Terrorism Policing North East said: "The public may have heard a loud bang at the time as police entered one of the properties, but it was not an explosion. "[We] would like to reassure them that it was part of the method to gain entry to the property." Ms Miller said: "[There] was very loud bang. It shook the house. "I pulled the curtains and saw lots of armed men in the street, so I kept watching because that was quite extraordinary." She said the officers shouted "very abruptly" for people to stay in their homes. Elizabeth Fogarty, who lives across the road from the house in Meersbrook, said: "I've only recently moved up from London. Such operations are only ever mounted because secret intelligence - perhaps from an intercepted communication and often only fragmentary - suggests there is something at a property they need to get to the bottom of. None of which is proof that any of those who have been arrested have committed an offence - but officers now have up to 14 days, subject to court oversight, to build a case. 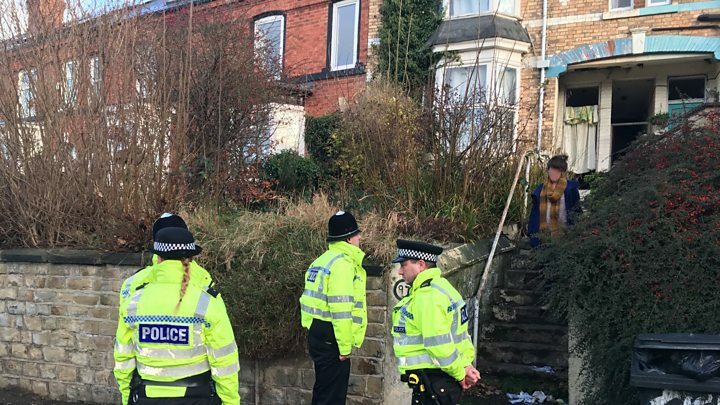 Supt Una Jennings of South Yorkshire Police said: "I understand our local communities will have concerns about this morning's police activity but I want to offer my reassurance that we will continue to serve and protect the public of South Yorkshire." Derbyshire's Assistant Chief Constable Bill McWilliam said: "We of course understand that police activity of this nature can be unsettling. "However, please be reassured, the arrest we wanted to make has been made. "Our advice remains to be vigilant, which is not different to our day-to-day advice in the current climate, but continue to go about your business as usual."